We would like to introduce The Cutest Clipart Pack to you from MyClipArtStore. This huge pack is stuffed with over 1200 graphic elements from 41 unique graphics packs. 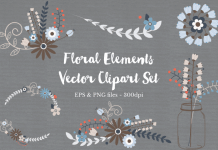 This huge clipart pack is just a must-have! At just $15 this bundle is at 93% off the regular retail price! All the graphics that are included are EPS & PNG formats. The package contains illustrations for special occasions, like Christmas, Winter Holidays, Valentine’s Day, St. Patricks’ Day & more! Even a Commercial Licence is included. Grab your copy today, because it’s a limited time offer! Download this beautiful bundle at thehungryjpeg.com.